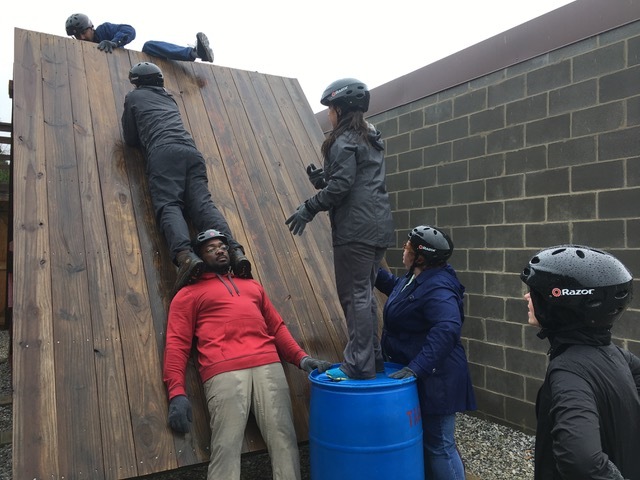 The Leader’s Reaction Course is one of many extracurricular leadership development activities offered by Goizueta, affording students the opportunity to get out of the classroom into a new setting for experiential learning. We reported to campus at 6 a.m. (I mean, 0600 hours) for a 0630 departure to Fort McClellan. Upon reaching the base around 0730 local time, I was apprehensive about what I’d gotten myself into as I saw a rather cold and rainy day out the window. We received our initial introductions and instructions from retired U.S. Army Lt. Gen. Keen, associate dean of Leadership Development at Goizueta. We were to complete obstacles within a time limit, with each member taking a turn as the leader. 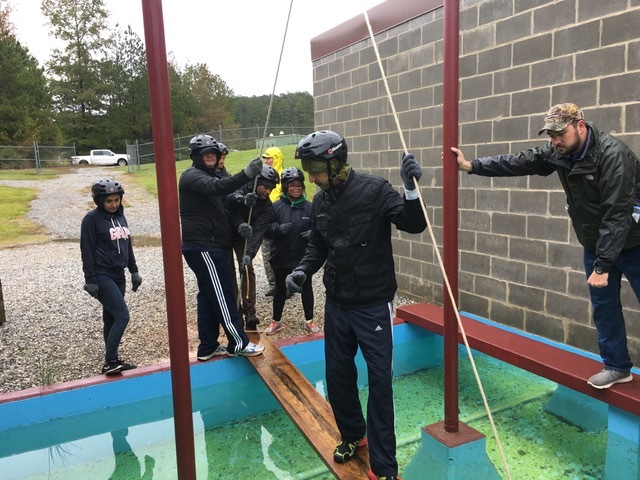 After completing each obstacle, we would conduct an “After-Action Review” to recap lessons learned, give feedback to each other and discuss how we could do better before attempting the next course. It became clear throughout the day how important this feedback was for our growth and continued success, just as in real life. The goal was to improve each time, not necessarily to complete the task at hand. When you arrive at a course as leader, you are briefed on the mission and related information. You turn to your team, quickly survey the few materials in front of you, and see five willing faces looking at you awaiting the plan. At times, you have no idea what you’re doing and you rely on your teammates for ideas (as Ben* put it, “it is not a flaw not to know, but it could be to pretend”). You make mistakes and learn from them. Your patience is tested both as a teammate and as a leader, and you quickly learn that if you don’t listen and communicate well, the whole team may fail. Leverage your team members’ individual strengths. Everybody has something different to offer, and we needed the combination of skills, height, physical strength and experience level to succeed. Listen thoroughly and communicate often. If the leader doesn’t understand the instructions well, the team either completes an incorrect or incomplete mission. Sometimes, a team member proposed a great idea that went unheard by the other members while distracted by the plan at hand. In many cases, we learned just as much about being a good team member as we did about being a good leader. Positioning is key. Position the leader in a location to watch out for the safety of, and to give direction to, other members of the team. Otherwise, valuable time and resources are lost and the team will be unclear on next steps. Strike a balance between devising a plan and acting on that plan. Once we got the balance right, it saved us time as those who hadn’t understood initially learned by seeing others begin the process. Know the difference between a strategy problem and an execution problem. If your plan isn’t working, having the flexibility to change course and try something new (and the humility as leader to ask for new ideas) can be the difference between success and failure. We recapped more lessons at the end of the day as one large group with our coaches, whom I feel deserve special thanks. 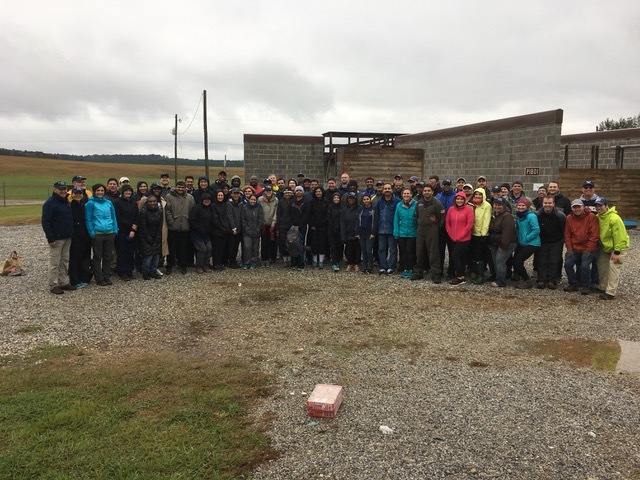 It was clear that every single one really wanted to be there, and knowing that they cared enough about our development to volunteer their time in the cold and rainy weather was humbling. The coaches — who included current and retired military leaders, as well as current students, alumni and more — went out of their way to give insightful feedback on both the task at hand and how it translated into the real world. We were all pleasantly surprised by how much we enjoyed the experience, and left with a deepened respect for our teammates and with memories we are unlikely to forget. We learned a lot about our own personal strengths and weaknesses in addition to the teams’, and will be receiving written feedback for an added growth opportunity. Although we may not have known what we were getting into that cold and rainy day, some things are better than a few hours of discomfort. In the end, the weather just made the experience more real. We still had tons of fun, and we are better leaders as a result of the trip. *Author’s note: I solicited thoughts from my WEMBA and EvMBA comrades to enhance the breadth and quality of this blog; their thoughts are sprinkled throughout. Thank you so much to Gretchen Crosby, Jason Bell, Assi Van Bastelaar, Neil Makhija, Krish Karthik, Dayanna Palacios and Ben Wedekind for your input!